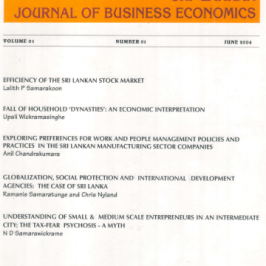 The Sri Lankan Journal of Business Economics (SLJBE) successfully published its latest volume, Volume 07, consisting of four research articles, in 2018. These research articles explore a range of research issues relevant to the present economic condition in both Sri Lanka and South Asia. The first article entitled, “Sri Lanka’s Strength as an International Industrial Location: A Theoretical Examination” by M. Rajaratne and P.W. Tennekoon, examines the strength of Sri Lanka as an international industrial location by adopting Investment Development Path (IDP) framework introduced by John Dunning and Rajnish Narula (1996). The findings reveal that Sri Lanka, in its current economic condition, has only been able to reach the early second stage of the IDP. 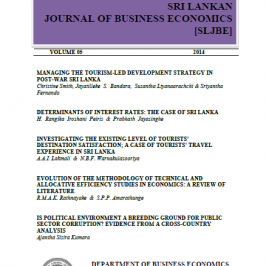 The second research article under the title, “Redefining FDI-Growth Relationship under Liberalized Economics Policies: Empirical Evidence from Sri Lanka” by P. J. S. Fernando and D. P. Rajapakshe, analyzes both short-run and long-run impacts of FDI on economics growth in Sri Lanka with special reference to the post-liberalized period of the country. The article concludes that there exists a positive impact of FDI on both short-run and long-run growth in Sri Lanka, yet the contribution of FDI towards growth in Sri Lanka is far below the expected level. 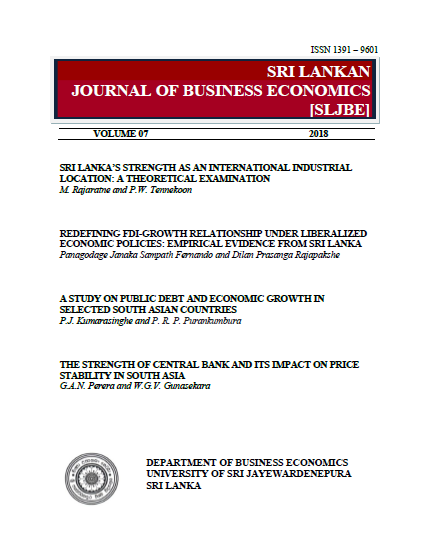 The third research article entitled, “A Study on Public Debt and Economic Growth in Selected South Asian Countries” co-authored by P. J. Kumarasinghe and P. R. P. Purankumbura, explores the long-run association as well as cause and effect of external debt and debt service on the economic growth of South Asian countries. The articles brings to light that external debt negatively affects growth in South Asian countries while a co-integration between external debt and economic growth prevails. The fourth and final research article entitled “The Strength of Central Bank and its impact on Price Stability in South Asia” G. A. N. Perera and W. G.V. Gunasekara, looks at the impact of Central Bank financial strength on price stability in the South Asian context. The empirical results show a significant negative relationship between the financial strength of the Central Bank and inflation. 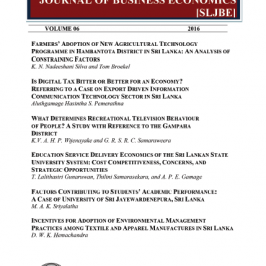 On behalf of the Editorial Board of SLJBE, I would like to thank the authors, reviewers, and all the other parties, especially Mr. Dilan Rajapakshe, Ms. Udeshika Chandrarathne and Mr. M. P. K. Withanawasam of the Department of Business Economics, Mrs. M. A. P. P. Chandradasa, Deputy Bursar and supporting staff at Supplies Division of the Faculty of Management Studies and Commerce, Ms. Krishani Kumarasinghe, copy editor of the volume, and Ms. Sepali Bamunusinghe, Coordinator of the Business Communication Unit of the Faculty of Management Studies and Commerce, University of Sri Jayewardenepura, for their valuable contribution to Volume 7 of SLJBE, which made it a success.